Now that the hustle and bustle of the holidays is over, you may be wondering how to spend the rest of your holiday vacation time before school starts back up again. 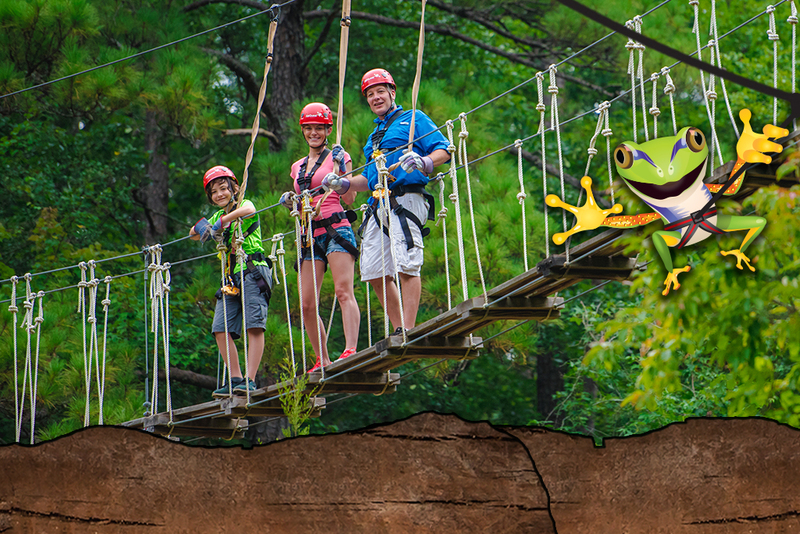 Nestled near Carver Falls in Fayetteville, North Carolina, ZipQuest Waterfall & Treetop Adventure offers patrons a unique, exhilarating ziplining activity that is sure to put a smile on the faces of everyone in your family. When you choose our Treetop Excursion, each member of your party will experience five tree to tree ziplines, a suspension bridge and two spiral staircases. Our Treetop Excursion is the shorter of the two zipline courses we offer. For a longer course, we also have our Waterfall Expedition that includes eight tree to tree ziplines, three suspension bridges and three spiral staircases. Patrons who choose the Waterfall Expedition get to experience the beauty and splendor of Carver Falls as well. Want to experience our ziplining adventures at night? We offer a seasonal NightQuest adventure which gives customers the chance to do our Treetop Excursion or Waterfall Expedition under the stars. When you book your zipline adventure, be sure to choose a time right after dark! For an extra shot of adrenaline, try out our sling shot attraction. We hoist you three and a half stories into the trees and release you over Carver’s Creek five stories below. It is sure to get your heart pumping as you take in the scenery around you. All of our staff are certified professionals that have been trained in safety procedures and educated on the Carver Falls area. We offer ziplining in North Carolina for residents and visitors alike ages 8 to 91 who weigh anywhere between 70 and 250 pounds. We require those enjoying our zipline adventures to wear closed toe shoes, and pants or shorts. We also request that no one wear dangling jewelry on our zipline courses. If you are looking for a fun family activity that everyone in your group will never forget, give ZipQuest a call at (910) 488-8787 or visit our reservation page on our website. Your North Carolina ziplining adventure awaits! Fall is finally here in beautiful North Carolina! Soon the temperatures will be coming down, the air will start to have a crisp feeling to it, and the leaves will start to change colors. If you have never had the opportunity to take in the beauty of fall foliage in North Carolina, you should start planning now. The peak times for foliage in North Carolina are early October for higher elevations and the last week of October for the remaining locations. Autumn truly is a gorgeous season in North Carolina. If you are looking for a unique way to see the changing colors of the leaves, ZipQuest Waterfall & Treetop Adventure is the perfect choice! Located in Fayetteville, North Carolina, ZipQuest Waterfall & Treetop Adventure is nestled in the woods overlooking Carver’s Falls. We offer patrons an exhilarating ziplining experience in NC with our tree-to-tree ziplines, multiple suspension bridges and spiral staircases. 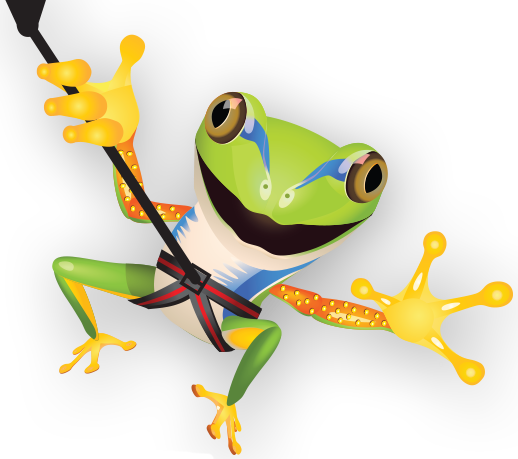 ZipQuest has ziplining adventures for the whole family from ages 8 to 91! We also offer team building packages for businesses and organizations, and if ziplining through the treetops at night sounds fun, we encourage you to experience NightQuest, a ziplining adventure using lighted helmets and the stars to guide your way. After Hurricane Florence, ZipQuest Waterfall & Treetop Adventure took the time to review our course and perform clean up and safety checks. Nothing is more important to the ZipQuest family than the safety of our visitors. Our zipline courses are now clear and safe for all. We are OPEN! Our hearts go out to all of the people affected by the high winds and damaging flood waters that Hurricane Florence brought to our area. We are grateful for the beauty of our surroundings everyday. Nature has given us plenty of beauty to marvel in, from gorgeous waterfall views to the changing colors of leaves in the fall. We cannot wait to share those beautiful views with you through an exciting adventure ziplining in NC. Make plans to spend some time with us in the coming weeks to enjoy the spectacular views! In central North Carolina, the average temperature in the month of August is near 90 degrees. Sometimes it can be hard to find ways to enjoy the outdoors in that kind of heat. ZipQuest Waterfall & Treetop Adventure offers a unique option for enjoying the warm temperatures before the weather starts to cool off again in the fall. 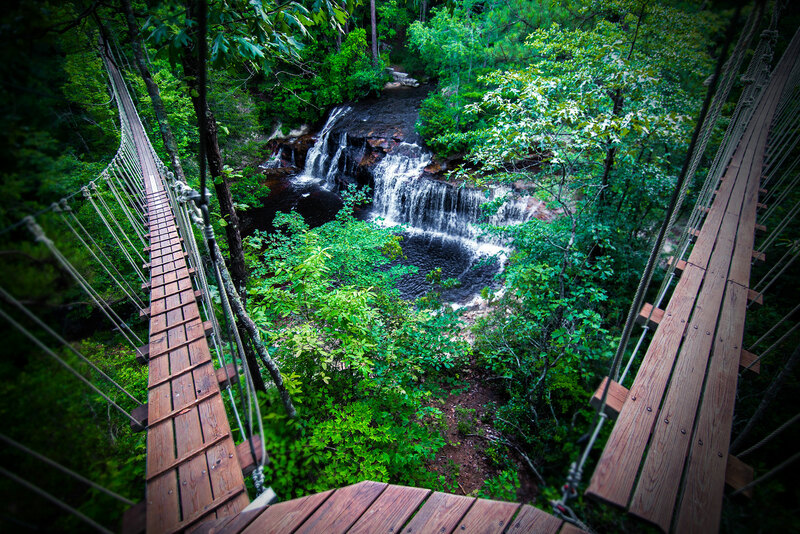 Located in Fayetteville, North Carolina, ZipQuest Waterfall & Treetop Adventure is situated under the shade of a landscape rich with green trees, lush plant life and calming waterfall views. Visitors have a few options for enjoying their time at ZipQuest. We offer two exhilarating ziplining adventures: our Treetop Excursion and our Waterfall Expedition. Our Treetop Excursion consists of five tree-to-tree lines, two spiral staircases and one suspension bridge. Our Waterfall Expedition includes eight tree-to-tree ziplines, three spiral staircases, three suspension bridges and a beautiful view of Carver Falls. Our Canopy Sky Bridges are all over 100 feet long, with the longest one boasting a length of 210 feet! For patrons that want to wait until the temperatures cool down a bit during the day, we also offer NightQuest, a nighttime ziplining adventure down our Treetop Excursion and Waterfall Expedition options that happens after hours on Friday and Saturday nights. Our regular hours of operation are Monday through Saturday from 9am to 5pm, and Sundays from 10am to 5pm. You will be able to breeze through the summer air carefree, as our highly trained and certified staff are with you, guiding you through your whole experience. It is a great adventure to share with family, friends, and coworkers. 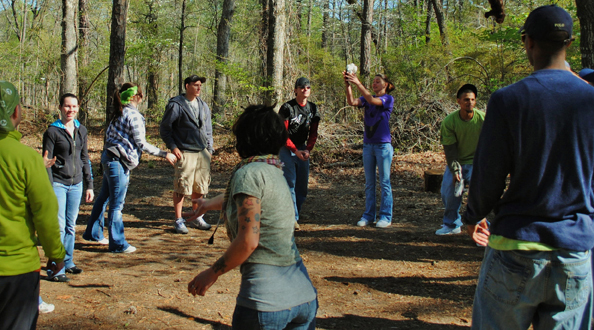 We also have the facilities and packages necessary to host your business or organization for a fun team building event. Anytime is a good time to come and visit us at ZipQuest Waterfall & Treetop Adventure. Most people who give us feedback after their time here tell us that they feel a sense of accomplishment, and that they look forward to coming back. If you are ready for some summertime ziplining in the shade, visit us online to book your adventure or give us a call at (910) 488-8787. We look forward to seeing you in our serene neck of the Carolina woods. Why zip in the rain? When it comes to outdoor activities, weather plays a big part in whether you go outside or stay indoors. Most people will not go outdoors if it is raining, but some people take advantage of the opportunity. You are probably asking who would want to go outside while it’s gray and rainy out? Many people take advantage of rain and go ziplining. Even though it does not rain a lot here in North Carolina, rain makes ziplining all the more fun! You don’t want to zipline when it’s storming or potentially going to be a severe storm. Dress in appropriate clothing if you know you are going to be ziplining in the rain. 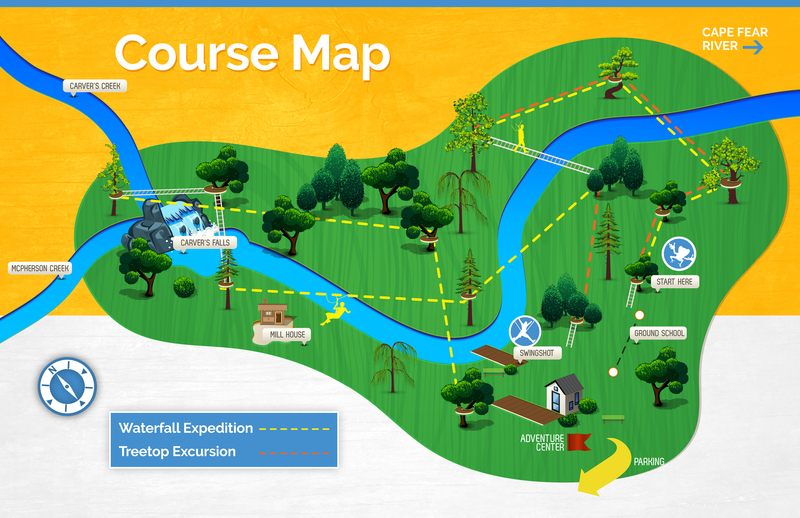 Every zipline course is different, so the rain will make every line feel and look different. Maybe you will be in a canopy, or in a wide open area where you can see wildlife hanging out. Remember getting rained on won’t ruin your day, it will just make it one hundred times better! Ready to zipline – rain or shine? Learn more www.zipquest.com. In just a few short weeks, public schools across central North Carolina will be releasing students for summer break. Many families will take the opportunity during the summer months to explore new places and try new family activities. North Carolina is a beautiful state to experience in the summertime, from the mountains in the west, the beaches in the east and so much in between. If you and your family are looking for neat ways to get outdoors this summer, ZipQuest has some ideas for you. Explore the Appalachian Trail. The entire west border of North Carolina is home to some of the grandest mountain views you will ever see. Tourists will find no shortage of trails to hike and rivers to explore. For the best possible North Carolina mountain experience, we suggest that you visit Mt. Mitchell, the highest point east of the Mississippi River, located a little more than 30 miles north of Asheville. You simply cannot beat the views! Enjoy the Atlantic Ocean. North Carolina borders the Atlantic Ocean on the east, and there are plenty of amazing beach towns to explore. The most popular are the Outer Banks, which includes Nags Head, Kill Devil Hills, Kitty Hawk, Roanoke Island and Cape Hatteras. Also popular are the southern beaches of Emerald Isle, Wrightsville Beach, Carolina Beach and Oak Island. If fun in the sun is your goal, you can’t go wrong with North Carolina beaches. If you are in central North Carolina and cannot make it to the mountains or the beach this summer, there is still plenty of fun to be had in the area! 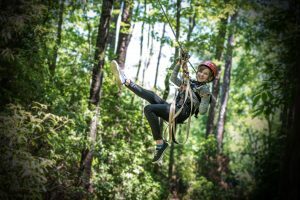 ZipQuest Waterfall & Treetop Adventure, located in Fayetteville, North Carolina offers families a unique ziplining experience that they are sure to never forget! Come zipline with us through the canopy of tall trees and the great outdoors. ZipQuest offers customers several ways to enjoy their adventure experience with us, including ziplining over Carver’s Falls. At ZipQuest, we also offer NightQuest, a way to experience ziplining underneath the stars! ZipQuest is for most everyone aged 8 to 91. Check out our FAQ page for more details. If you are looking for activities to do as a family this summer, North Carolina is full of opportunities! Are you ready for your ziplining adventure? Check out ZipQuest Waterfall & Treetop Adventure today! The weather this winter in North Carolina has been exciting. After several weeks of temperatures ranging from mildly cold to really cold, and a few snow and ice days, we have recently been reminded that warmer weather will inevitably be back in full force and that spring and summer are just around the corner. 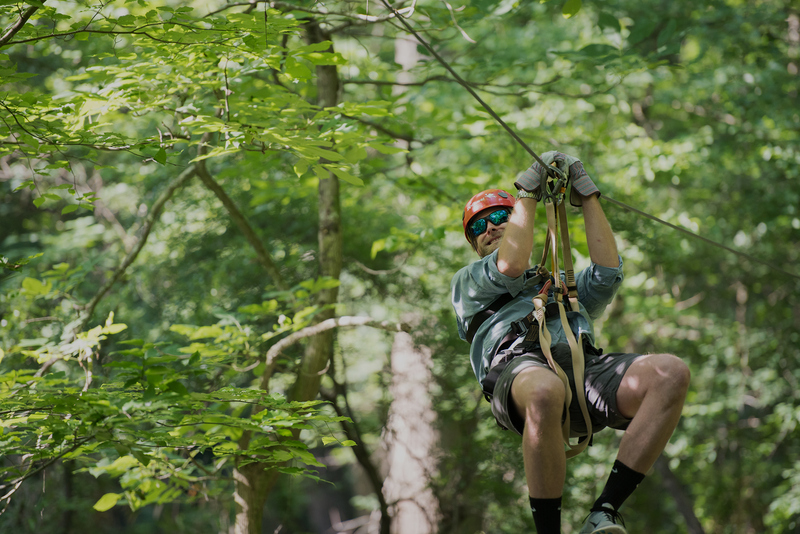 With the weather warming back up, now is the perfect time to discover central North Carolina’s newest family pastime – ziplining. 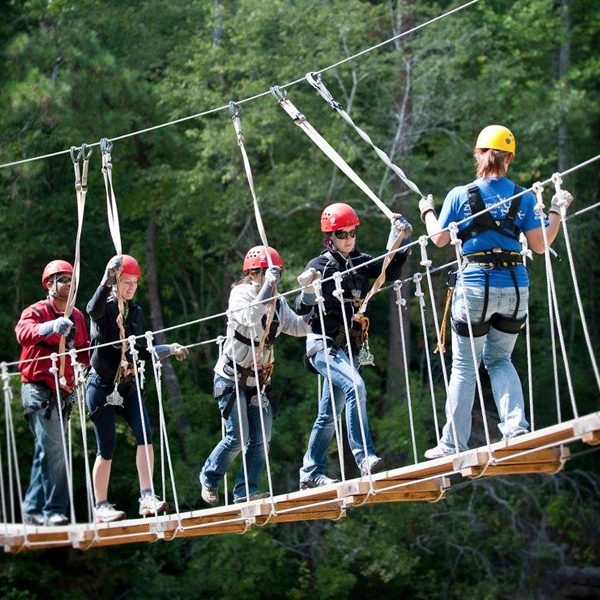 ZipQuest, located in Fayetteville, North Carolina, offers thrilling ziplining adventures through several acres of heavily wooded areas and over Carver Falls, the biggest waterfall in eastern North and South Carolina. Nestled in the middle of a beautiful natural landscape in central North Carolina, ZipQuest is only a couple of hours east of the Atlantic Ocean and a few hours west of the North Carolina mountains. 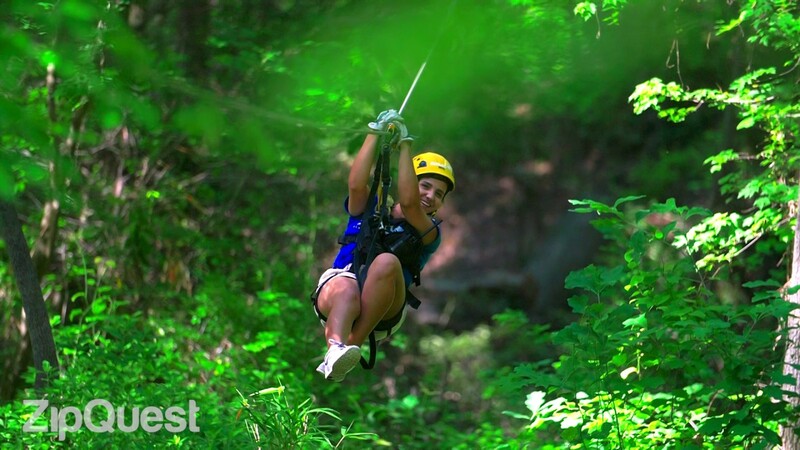 ZipQuest offers two ziplining courses – the Tree Top Excursion and the Waterfall Expedition. The Treetop Excursion consists of 5 ziplines, a suspension bridge and 2 spiral staircases. The Waterfall Expedition consists of 8 ziplines, 3 suspension bridges, 3 spiral staircases and a magnificent view of Carver Falls. ZipQuest also offers Night Quest for those who want to do the Treetop Excursion course or the Waterfall Expedition course at night. Every ZipQuest course is lead by our certified and highly trained staff who will guide you safely through your ziplining experience. ZipQuest also offers team building options for groups of up to forty that include our two ziplining courses, team building with a TeamQuest leader and a catered lunch if requested. Ziplining is the perfect team activity for your organization or group! An experience that your team is sure to never forget. The ziplining experiences at ZipQuest are available Monday through Saturday between the hours of 9am to 5pm, and Sundays from 10am to 5pm. Our ziplining courses are open to visitors age 8 and above, making them a great option when you are looking for a new, fun activity for your family! When the weather turns warm and beautiful, and you are looking for something fun to do, look no further than ZipQuest. Your thrilling ziplining adventure awaits!